We have a super fun project to share with you guys today. One that applies to basically everyone, no matter your style, taste or even skill level! 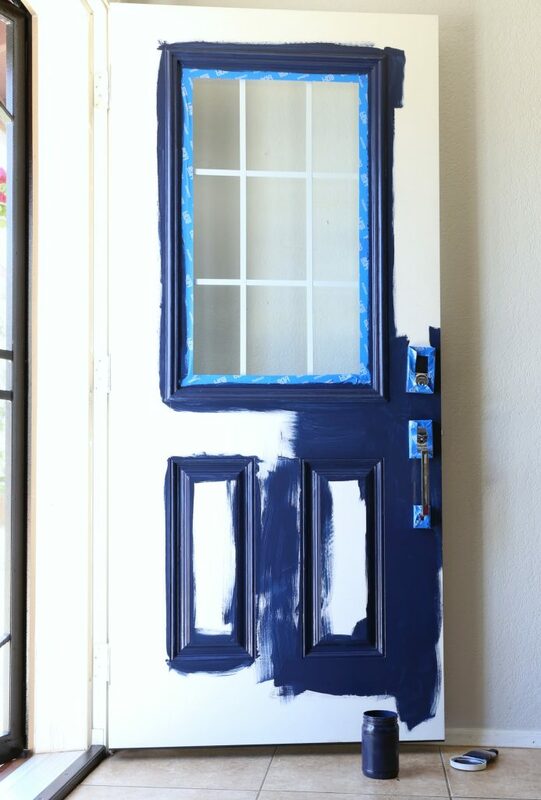 Today we’re sharing how to paint a front door (or repaint). We are painting the exterior of Savannah’s front entry door of her house today. She’s in a rental so we knew we would just be able to do cosmetic updates to the outside. 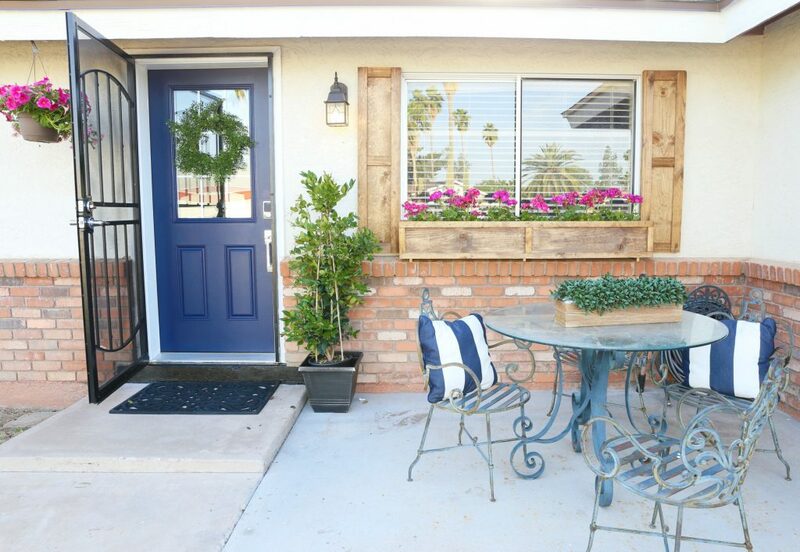 The plan was to paint the front door, some other paint updates (the step under the door, repaint the foundation, facia and door casing), add shutters, a window box and some plants and flowers. 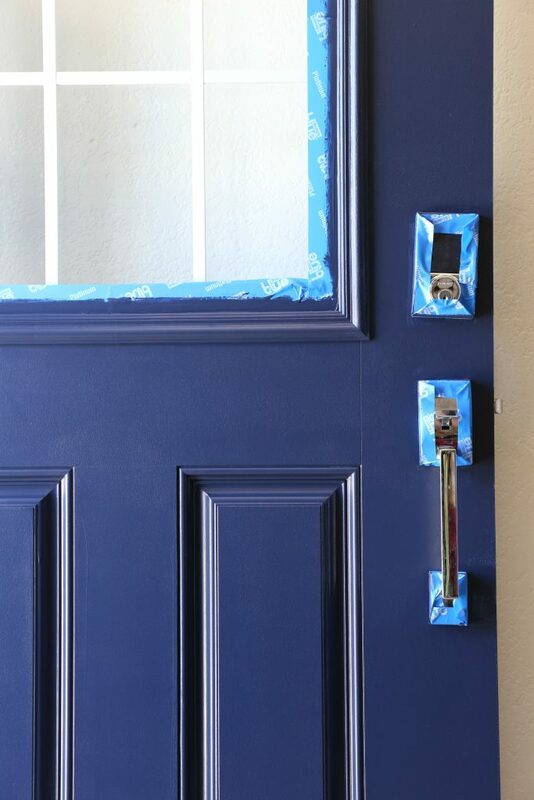 If you’re in a rental, be sure to check with your landlord first before painting a door! The front door was replaced a few months ago. It came primed but not painted and she waited and waited until she decided on the perfect color to paint it. She finally decided she wanted a deep, rich navy so we got to work! Make sure your door is clear of any dust, lint, dirt, wax etc. Using an all-purpose cleaner and a cleaning cloth to scrub any dirt off of your door. Allow to dry before the next step. 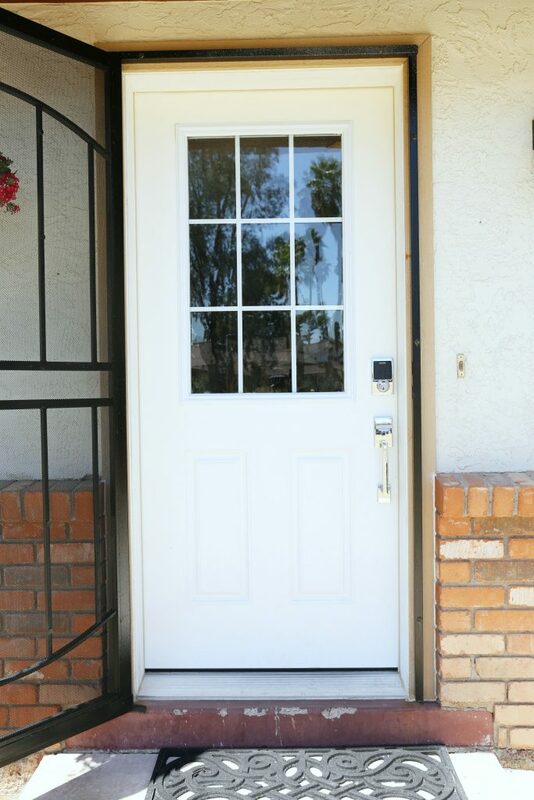 Cleaning your door well will ensure the most crisp paint lines and a smooth and durable finish on your front door. 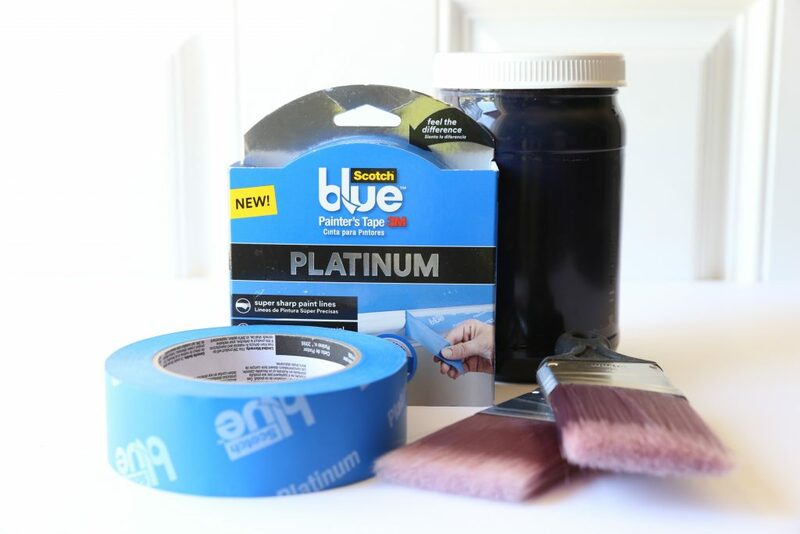 Once your surface is completely clean, apply ScotchBlue Painter’s Tape on windows, glass, door knobs, deadbolt locks, etc. Basically over anything you do not want painted. 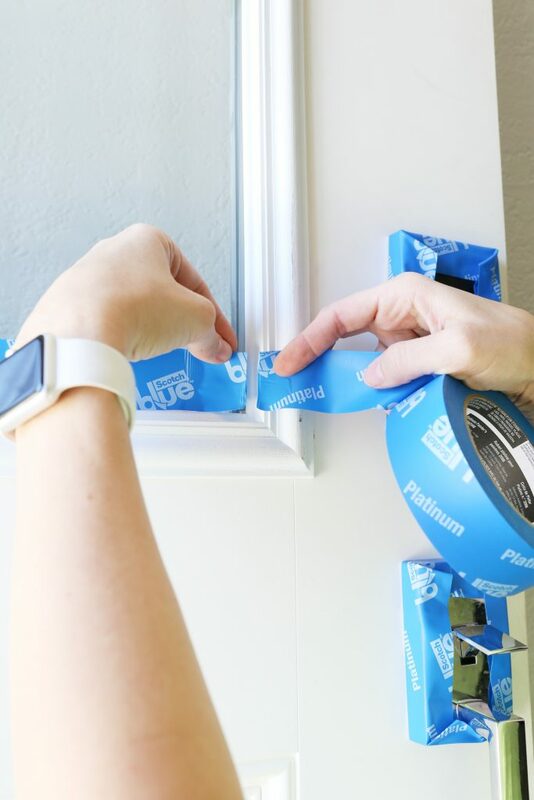 Take care to apply it straight and use a putty knife to smooth and add pressure to the tape to ensure a tight seal for the paint. 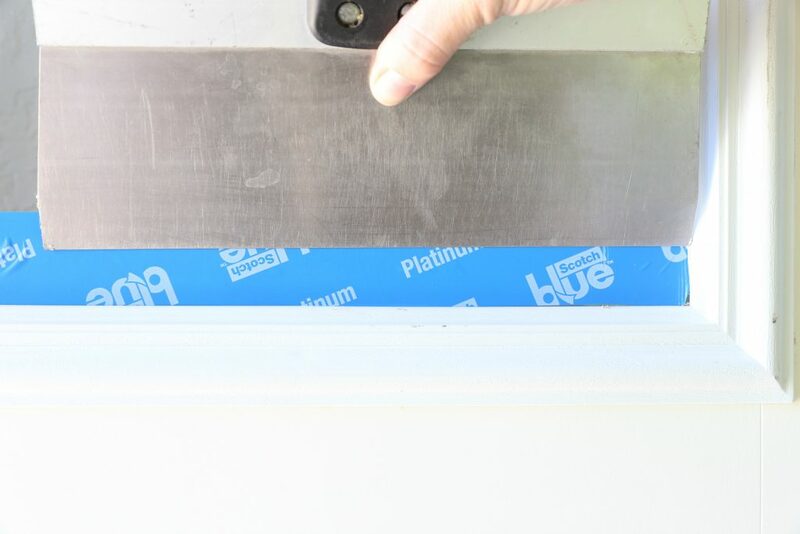 For tricky angles, ScotchBlue PLATINUM Painter’s Tape tears at perfect 90 degree angles. This was especially helpful around the window. 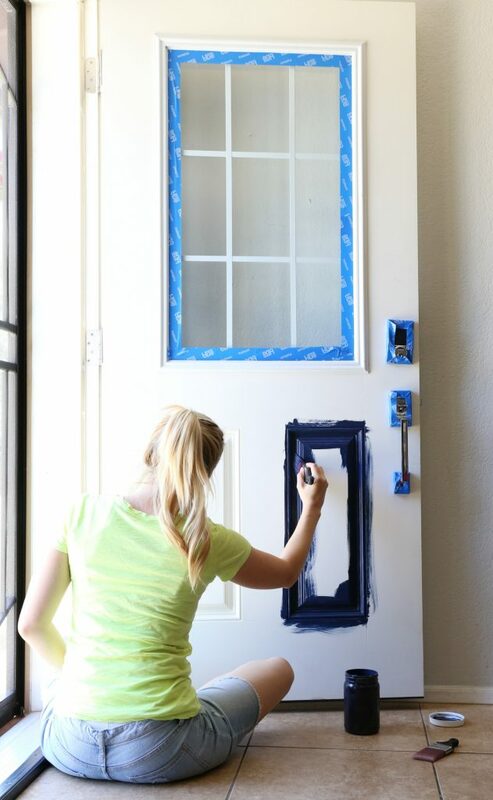 Start painting your door by painting the details of the door first. When painting a door, we paint the decorative areas and the window casing first. Paint the rest of the door. We used both a paintbrush and a roller and did 2-3 coats of paint. 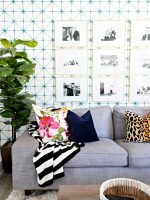 Allow each coat to dry completely before doing the next coat. The brush gave a bit better coverage but the roller helped provide a really smooth looking finish without brush strokes. 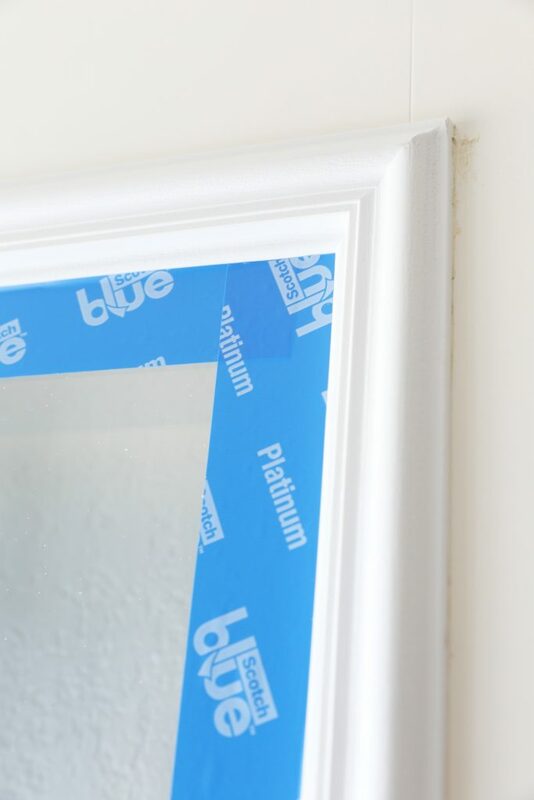 Carefully remove the Painter’s Tape at a 45 degree angle while paint is still tacky. Allow to dry. While the door dried, we also painted the door casing and the step beneath the door. 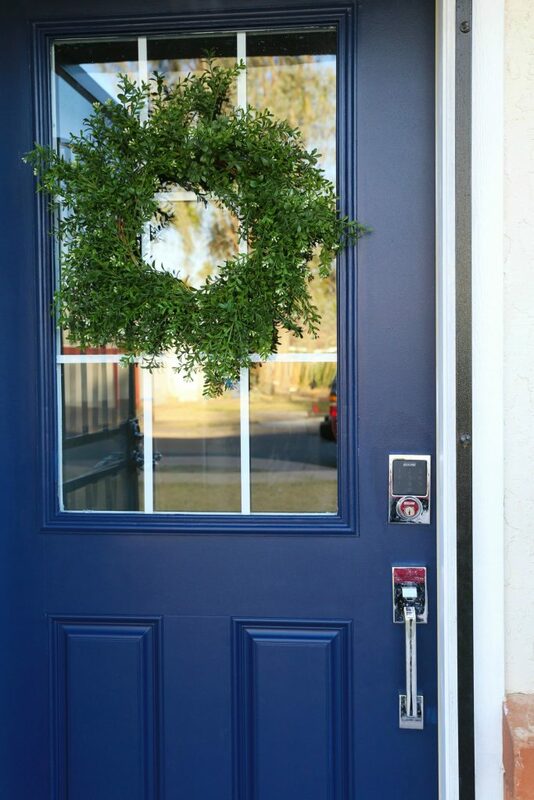 The faux boxwood wreath was hung with a command hook directly on the glass and we love the color and freshness it adds. The shutters, window box, plants and flowers are all new and totally change the look and add to the curb appeal of the house! We love how it turned out! We are excited to be 3M-sponsored bloggers. 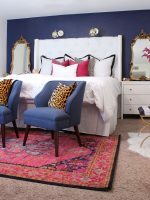 Opinions are my own and additional products used in the project were selected by us for How to paint a door with ScotchBlue. Congratulations, you did a professional work here! The color you’ve chosen is also outstanding! Great job! Make a huge difference!!! Love the blue with the black! 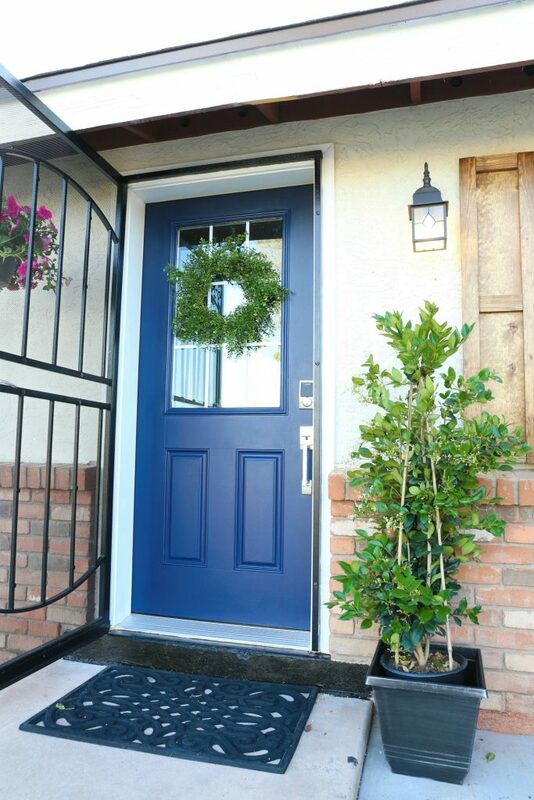 We just painted our front door a vibrant blue recently and I’m hoping to paint the trim and storm door black if I can convince the hubs! What color and brand of paint is this door? Love the updated look!!! 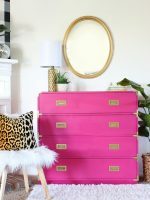 Could you please share the paint brand/color that was used? It’s exactly the shade of blue I’m looking for! I love this update, can you share the door color ? Thanks !!! Beautiful, can you share the color you used for the door ? Thanks !!! Any suggestions for a front door with an oval window. 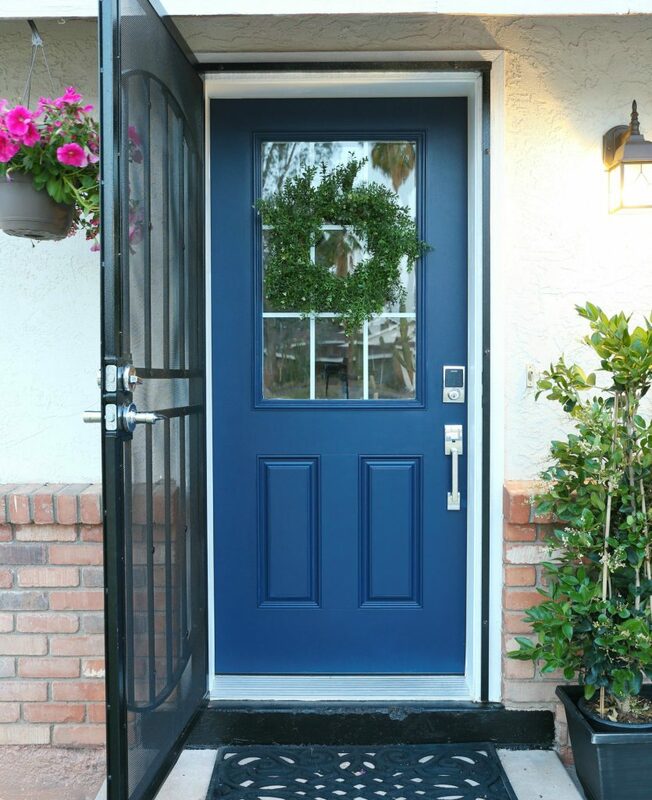 What color blue did you use for your door? Thanks! What happens if your front door is in direct light most of the day? How long did you let it dry between coats? Oh great ! i can also make so many designs with this tape technique. Thanks a lot.